Clarendon Terrace was erected in 1856-57 by Robert Huckson for Charles Lister, a wine and spirit merchant and brewer. The architect was Osgood Pritchard. The building was later owned by the Marks family who were jewellers and opticians in Elizabeth Street. During Lister's ownership a number of other distinguished citizens were tenants of No. 210. Samuel McGowan, superintendent of the Electric Telegraph, occupied it during 1862 and 1863, followed G.C. Levey, M.L.A. during the 1864 and 1865 and Ah Mouy, well known Chinese merchant, rice miller and financier, from 1866-1869. Richard Goodhind, a malt and hop merchant, was the tenant of no. 212 during 1867 and 1868. Clarendon Terrace is three two-storey houses constructed in the Victorian Free Classical style. The main feature of the building which is of blue stone and rubble wall construction with a cement rendered facade is its central giant order portico with Corinthian columns. The building also has elaborate fenestration and stucco detailing. The site also contains the former stables and a cast iron palisade fence facing Clarendon Street. In May 1977 the property was earmarked for demolition. There was a public outcry and in August 1977 the government announced that they would provide the National Trust with an interest free loan to buy and restore the property. In 1980 the National Trust were approached by the Sir Robert Menzies Foundation with a proposal whereby the foundation would lease the building from the National Trust for 45 years at a peppercorn rental in return for meeting the costs of restoration. This proposal was accepted. Two of the three houses were reconstructed internally to meet the foundation?s requirements, whilst the third was restored to its original appearance. 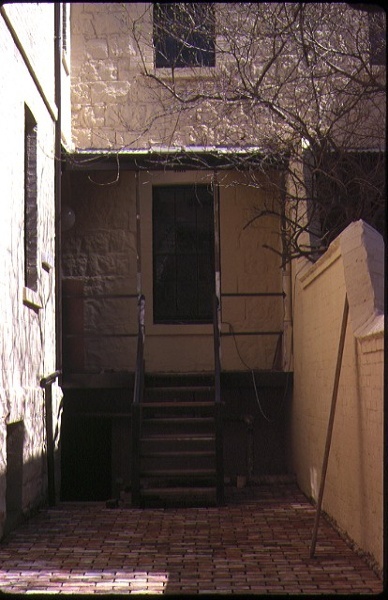 The Sir Robert Menzies Foundation currently occupies Clarendon Terrace. Clarendon Terrace is of architectural and aesthetic importance as one of Melbourne?s grandest terraces and an important work of the architect Osgood Pritchard. 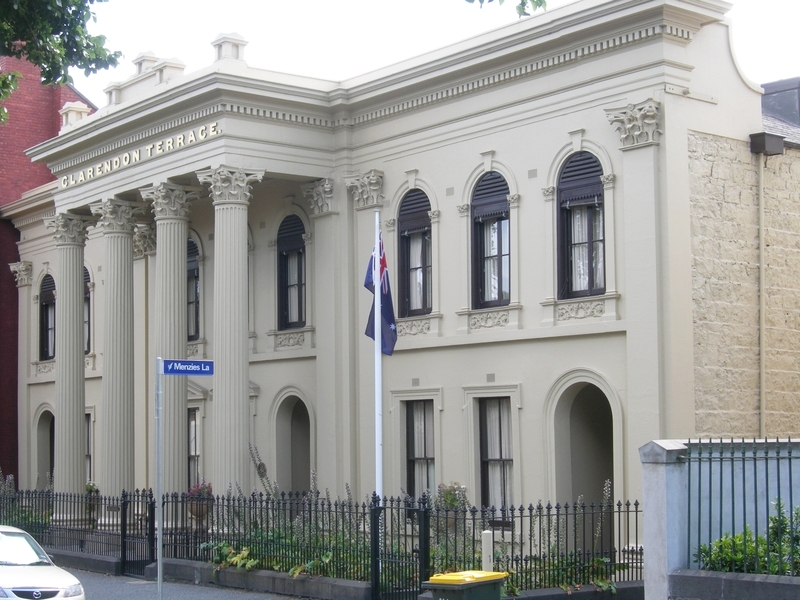 The Victorian Free Classical style composition with the giant order Corinthian portico is rare in Victoria. There are very few giant order residences in Australia and it is therefore of outstanding architectural importance. Clarendon Terrace in Nile, Tasmania is another example of a giant order residence. 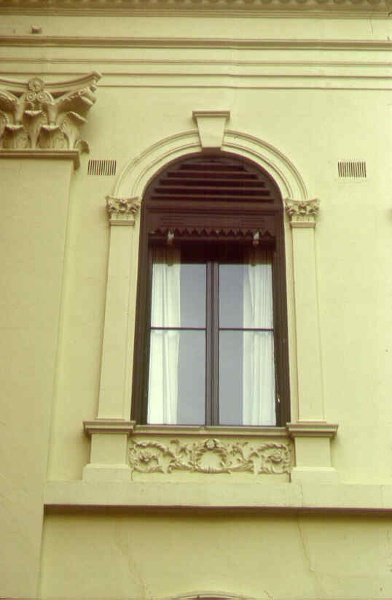 The semi-circular arched entrances, window mouldings, pilasters and the parapet finials are particularly notable. Clarendon Terrace is aesthetically important as an outstanding feature of the East Melbourne area and a fine example of a terrace. 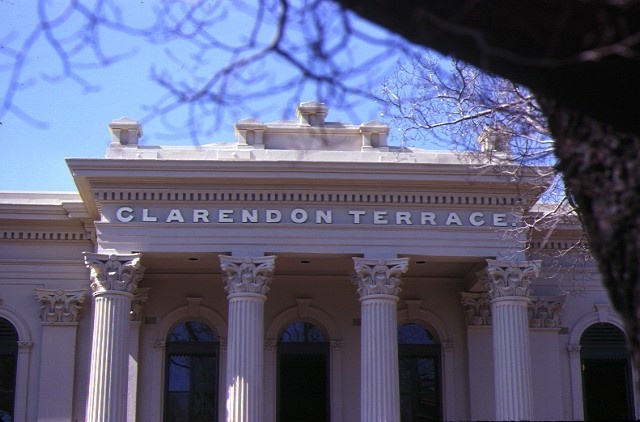 Clarendon Terrace is of social and historical importance as an early example of a grand Melbourne terrace. Construction commenced in 1857 so that it pre-dates the large bulk of terrace housing in the inner suburbs of Melbourne. It is important for its associations with notable Melbourne identities such as Charles Lister, a wine and spirit merchant and brewer, Samuel McGowan, superintendent of the Electric Telegraph, G.C. Levey, M.L.A and Ah Mouy a well known Chinese merchant, rice miller and financier, from 1866-1869. Clarendon Terrace is socially and historically important for its associations with the preservation movement in Victoria. The public outcry and subsequent processes that took place to save Clarendon Terrace after it was earmarked for demolition are an example of community concern over heritage issues and demonstrate the value Victorians place in their heritage. Clarendon Terrace, 208-212 Clarendon Street, East Melbourne, Melbourne City Council. 1. 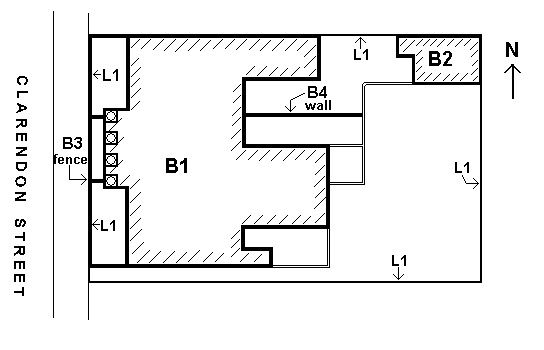 All of the building known as Clarendon Terrace B1, former Stables B2, Fence B3 and Wall B4 marked on Diagram 29 held by the Executive Director. 2. All the land marked L1 on Diagram 29 held by the Executive Director, being the land described in Certificate of Title Vol. 7341 Fol. 129 as Crown Allotment 20, Section 10 at East Melbourne, City of Melbourne, Parish of Melbourne North, County of Bourke. In Australia, as in all parts of the world touched by Western imperialism, Victorian architecture was essentially about confidence, material progress, prosperity and the triumphant survival of the fittest. The classical and romantic streams of nineteenth century architecture flowed with ever increasing volume and vigour. In the classical stream, Georgian reticence was swept away by full-blooded adaptations of the High Renaissance and Mannerism, with occasional touches of the Baroque. Domestic architecture displayed a bewildering variety of interpretations of-and combinations of-classical and romantic themes drawn from many sources. The Victorian architect’s typical client for a large house was a self-made man whose overriding requirement was that his home should be an embodiment of his success in the rough and tumble world of free enterprise. (Apperly, Irving, Reynolds, 1989, p. 41). During Lister’s ownership a number of other distinguished citizens were tenants of No. 210. Samuel McGowan, superintendent of the Electric Telegraph, occupied it during 1862 and 1863, followed G.C. Levey, M.L.A. during the 1864 and 1865 and Ah Mouy, well known Chinese merchant, rice miller and financier, from 1866-1869. Richard Goodhind, a malt and hop merchant, was the tenant of no. 212 during 1867 and 1868. The second owners, the Marks family, Margaret, Jacob and Benjamin, were jewellers, watchmakers, electro-platers and opticians in a shop in Elizabeth St opposite the post office. They let No. 210 to medical men. Dr. H. W. Wilson was its tenant from 1877 to 1885 and Dr. J.H. Courtney from 1886 to 1890. Henry Marks occupied No. 208 from 1877 to 1880 and Jacob Marks occupied No. 212 from 1881 to 1888. Medical men were associated with Clarendon Terrace again from 1949 when Drs. T.M. Wright, E.M. Wright, M. Balaam and L. Parr, of 71 Collins Street purchased it at an auction for 9, 600. They later sold it to Dr. James Walker Johnstone in 1955 for 13, 900. E.M. Anstey was the occupier of No. 208 from 1950 to 1955. The building has sheltered a number of distinguished occupants including Samuel Walker McGowan (1829-1887). McGowan came from Londonderry, Ireland, and had long been fascinated with telegraphy which he had studied under Samuel Morse. He arrived in Melbourne in 1853 intending to form a private company to provide telegraphic linkage between Sydney, Melbourne and Adelaide as well as the goldfields. However, the government resolved to make all telegraphic lines a public monopoly and in September, 1853 it was resolved to call tenders for an experimental line between Melbourne and Williamstown. McGowan’s was accepted. On 1 March, 1854 he was appointed general superintendent of the electric telegraph department of Victoria and by the end of October telegraph communication flowed freely between the three capital cities. Another distinguished resident was George Collins Levey, M.L.A. C.B.E. Levey had a colourful and varied political and public life. By 1863 he was editor and chief proprietor of the Herald and reduced its price to 1D thereby pioneering cheap newspapers. Until 1891 he was a contributor and sometime editor of the Age. He had an active political life. He introduced the alien’s bill and amendments to the Duffy Selection Act maintaining that 99 % of applications for land near Hamilton were made by speculators. He became secretary to the Commissioners at the Sydney exhibition in 1870 and represented Victoria at a number of other exhibitions including Paris (1878) where he was awarded the Legion D’Honneur. Other activities included the publishing of a number of works of which ‘The Handy Guide to Australia and ‘Hutchinson’s Australasian Encyclopedia’. In 1881-2 he served on the Royal Commission inquiring into the Kelly outbreak and performance of the police. In May 1977 the property was earmarked for demolition. A development company were given a permit to demolish the building and intended to construct a two-storey office block. There was public outcry. In August 1977 the Government (Minister for Planning Mr. Hayes) announced that they would advance funds to the National Trust to allow for the purchase of the property and to help with its restoration. It also assisted the National Trust in the conduct of a public appeal. Interest free loan to buy and restore the property. Initial plans were to develop the Terrace of three houses into a Town House complex, which could be sold at a profit, thus enabling the Trust to institute a rolling fund ploughing the profit back into the purchase and preservation of other historic buildings. However in 1980 the National Trust were approached by the Menzies Foundation with a proposal whereby the foundation would lease the building for 45 years with the right of first refusal of purchase in the event of the National Trust deciding to sell. Two of the three houses would be reconstructed internally to meet the foundation’s requirements, whilst the third would be faithfully restored to the period, so far as practicable. In return for the Foundation meeting the costs of restoration, the National Trust would lease for a peppercorn rental, and also contribute any monies remaining at credit in the Clarendon Terrace. This proposal was accepted and the Sir Robert Menzies Foundation currently occupies Clarendon Terrace. Clarendon Street, was erected in 1856-57 by Robert Huckson for Charles Lister, a wine and spirit merchant and brewer. Construction of Clarendon Terrace commenced in 1857 and therefore pre-dates the large bulk of terrace housing in the inner suburbs of Melbourne. 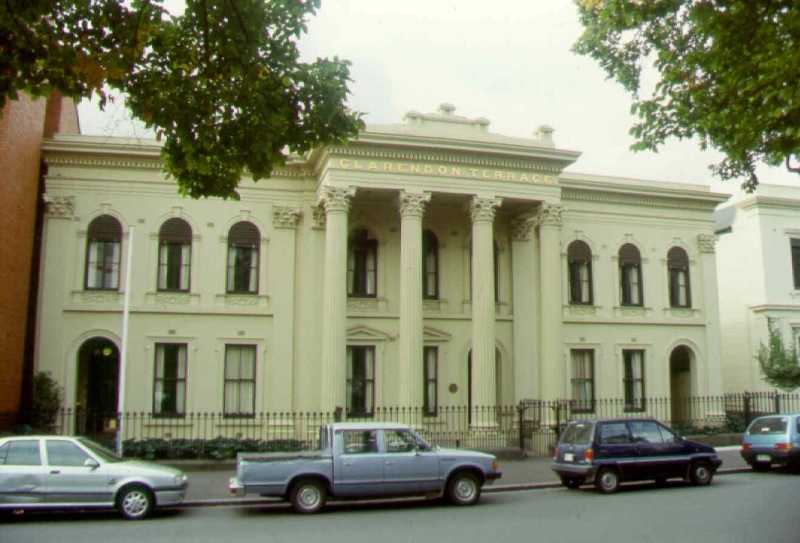 The Victorian Free Classical style composition with the giant order Corinthian portico is rare in Victoria. There are very few giant order residences in Australia. Clarendon Terrace in Nile, Tasmania is another example. It is an outstanding feature of the East Melbourne area and a fine example of a terrace. Clarendon Terrace is of architectural importance as one of Melbourne's grandest terraces and an important work of the architect Osgood Pritchard. The semi-circular arched entrance, portico and first floor window mouldings and the parapet finials to the portico are particularly notable. Clarendon terrace is important for its associations with notable Melbourne identities such as Charles Lister, a wine and spirit merchant and brewer, Samuel McGowan, superintendent of the Electric Telegraph, G.C. Levey, M.L.A and Ah Mouy a well known Chinese merchant, rice miller and financier, from 1866-1869. 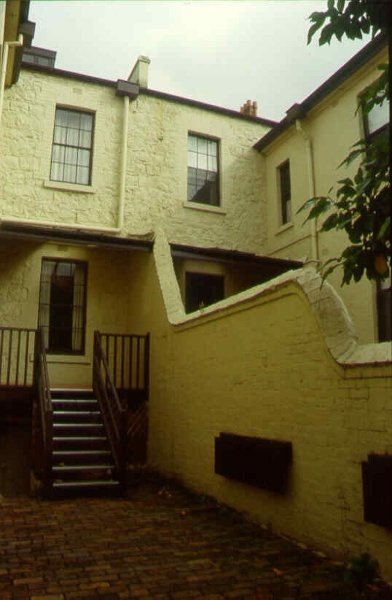 Clarendon Terrace is important for its contribution to the history of the preservation movement in Victoria. The public outcry and subsequent processes that took place to save Clarendon Terrace after it was earmarked for demolition demonstrate the importance of heritage places to Victorians. The main importance of this terrace lies in its front facade with its rare giant orders. The stucco detailing is also of significance and should be protected. Internally terraces 208 and 210 have been altered considerably, however No. 212 retains its original floor plan, and this should be protected. 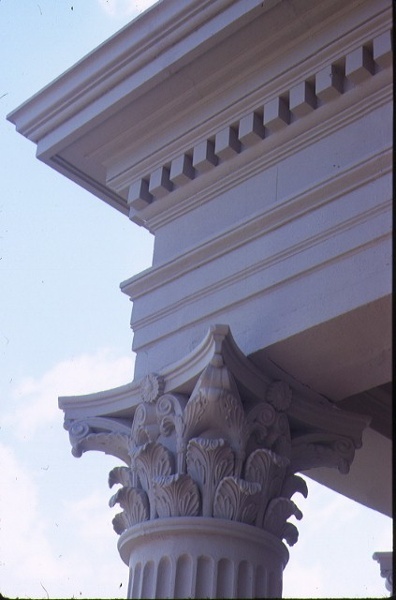 Restoration or reinstatement of missing decorative elements should be encouraged. The former stables have been considerably altered, however their form and position should be retained.